There must be more to consider, in this important decision. 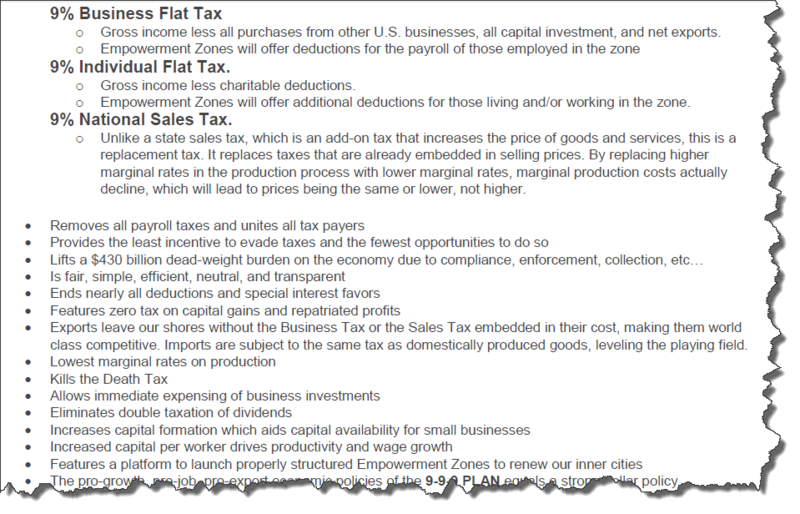 So, I started by looking at Herman Cain’s 999 tax reform plan. See more at his website, with the key bullets in the insert below. Bear in mind that I’m a former Deputy Assistant Secretary of the U.S. Treasury (1985-87), so I worked hard on President Reagan’s successful “Tax Reform Act of 1986” to lower the rates and broaden the base. Since 1986, however, Congress has managed to reintroduce plenty of new deductions and tax breaks, while raising the rate. Maybe it’s time to do something again! Cain’s proposal has a lot of similarities to the 1986 reform, if perhaps more extreme. It is meant to be revenue neutral, raising the same total tax. It would eliminate virtually ALL deductions, like mortgage interest paid, and it would cut rates drastically. It would eliminate the income tax as we know it, and introduce a national sales tax (or value added tax). What about the accuracy of Cain’s claims below? By reducing rates drastically, this proposal probably WOULD reduce the distorting effects of taxation by reducing the interference of taxes in the productive activities of workers and business – what economists call “deadweight loss”. For similar reasons, it probably would provide greater incentive for work and investment, and therefore probably provide some stimulus to growth. That’s all for the good. However, ANY tax reform plan of ANY politician EVER, no matter what motivation, will always have two effects to watch out for. First, any tax reform will always raise taxes on some taxpayers and reduce taxes for others. It will have distributional effects worth analyzing. Second, it will therefore create disruptions and reallocations. Activities to pay additional tax may shrink – laying off workers who may remain unemployed for some time until they can re-train and find work in other activities that now face lower tax rates and hope to expand. That is, for only one example, the Cain plan might hurt homeowners and homeownership by eliminating the mortgage interest deduction. With such pervasive changes, however, the disruptions will be widespread and costly in themselves. Finally, for now, note the point about distributional effects. Nothing in any of Cain’s bullets says anything whatever about distributional effects. I’m afraid this point is the Achilles heel of Cain’s 999 plan. According to the non-partisan Tax Policy Center, Cain’s plan will greatly reduce taxes of those with the highest incomes and raise total taxes on those with low incomes. It is ‘regressive’. And you don’t even need to read the TPC analysis to know this is true. Cain’s plan cuts the top personal rate from 35% to 9%. There is no amount of tax-base broadening for those high income taxpayers that can get back the same tax revenue from them. And currently those with the least income pay no Federal tax at all. Under Cain’s plan, everybody will pay the 9% sales tax, on everything they buy. Moreover, if those low-income individuals are working, they will probably bear some additional burden of the 9% business tax that applies to all profits AND wages paid: it applies to all sales revenue minus purchases and capital investment, not subtracting wages paid to workers. I’d personally favor another revenue-neutral reform like the TRA of 1986, one that lowers the rates and broadens the base. Such a reform would undoubtedly cause some disruptions and adjustments costs. And it would help some while hurting others. But perhaps it could be designed in a way that also tries to be distributionally neutral, not adding tax burdens on those least fortunate while cutting taxes on those already doing well. Are U.S. Taxes Too High? The last-minute deal between Congress and the President managed to save the day, just before the deadline, but it’s not a very specific plan. Any coherent long term plan for serious deficit reduction will still have to include cuts to defense and cuts to entitlement programs like Social Security and Medicare. But the Republicans did not want to cut defense, the Democrats did not want to cut Medicare, and they can’t cut the large portion of the Federal budget that goes to interest payments on existing debt. So instead, in the short run, they load high percentage cuts onto the small percentage of the remaining Federal budget that could be called discretionary. Thus it seems we will experience very large cuts to items like National Parks, environmental programs, highways, training, education, and social infrastructure. If the American people really want a government that is extremely small, especially compared to other developed economies such as those in the OECD, then the deficit problem could conceivably be solved by spending cuts alone (as long as those cuts include defense and entitlements). Certainly some Tea Party Republicans want a Federal budget that small. But I suspect that some other Republicans only think they want a Federal budget that small and would change their minds once they see the decimation of so many Federal programs. In 2009, before the current round of cuts, the United States ranked third-to-last among the 23 OECD countries for the percentage of GDP collected by government. I’m sure we would not want to match the 48% collected by some Scandinavian countries, or even the 40% collected by other European countries. 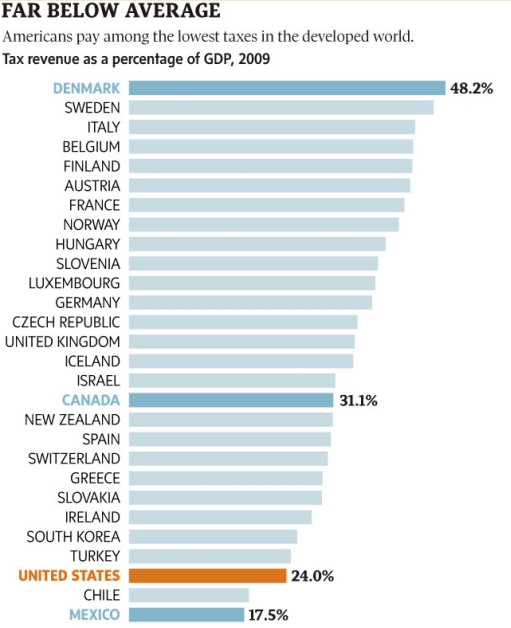 Somewhere in the middle, Canada appears with 31% of GDP collected by government. The United States stood at only 24%, which exceeds only Mexico and Chile. With only spending cuts and no increase in taxes, the U.S. could soon have the smallest government among all 23 nations of the OECD. The following graph is from the Toronto Globe and Mail. What might this mean for our state? Illinois is quite unusual, having just raised the State income tax to cover some of the growing annual deficit. Other states with new Republican governors have drastically cut spending instead of raising taxes. These actions might nudge Illinois upward, in the ranking of states by the ratio of tax collections to total state income, but it may allow Illinois to meet more of its obligations (including unfunded pension liabilities). If Illinois did not raise any taxes, it may have had to renege on some such promises. Republicans would tell you that smaller government and a smaller tax bite is always better for job growth. But it’s a matter of degree, and a matter of balance. A state with the smallest possible budget would have very little spending on infrastructure, road quality, sanitation, police protection, education, training, and other social services. Yet many of those programs are important for businesses to be able to function properly. The trick is to find the right balance, with spending on the minimal decent level of such programs, as necessary for businesses and employees alike. With no increase in Federal taxes, the recent deal on cuts in spending is likely to mean cuts in all kinds of Federal discretionary spending, including grants to the states. The U.S. Congress will then be likely to enact more unfunded state mandates, which means requiring the states to spend their own money to provide basic services that the Federal government used to provide. State governors and legislators will be unhappy about these changes, with even more pressure on state governments. Now, this is a point that I often make in class. Curiously, however, when I make it I start by saying that corporations are NOT people. That is, they don’t eat. When money goes into a corporation, it isn’t like the corporation uses the money to buy fancy cars and big screen tv’s for its own enjoyment. Money that goes into a firm goes to pay its bills, and what’s left over is split between its employees and its owners. In the case of a publicly traded corporation, the owners are the people who own stock in the company. In this light, the logical fallacy underlying the belief that corporations can be taxed without harming anyone becomes clear. If you take money from the corporation and give it to the government, this is not without consequences. That money is coming out of someone’s pocket. Sometimes that money may be coming out of the company’s top executives’ bonuses, but other times the pocket in question belongs to a middle-class worker who has his or her retirement money invested in the stock market. Now, I don’t mean this as an argument for or against raising corporate taxes. Rather, I simply want to point out that raising corporate taxes is a form of redistribution from the owners of the firms (and the firms’ customers if the higher taxes cause them to raise prices) to the recipients of government services, and these owners may be the very same “hard working middle class Americans” whose welfare we are raising taxes to protect. This may or may not be desirable. But, corporate tax revenue is not “free money.” Despite the joy of a good Gotcha Moment, Romney was right on this point. Most people dislike paying taxes because every dollar sent to the government is one less dollar they have to spend themselves. Because taxes make people “poorer” (ignoring, for a moment, the fact that many of those tax dollars are returned to citizens in the form of Social Security income, health benefits, or other government services), they have less money to spend on goods and services. This is what economists call the “income effect” of taxes. While this is the part that most normal people dislike, it is not what economists typically care about. You see, economists recognize that if you need to raise revenue, then it has to come out of somebody’s pocket. And whoever’s pocket you choose to take it from will cause that person to have less money to spend. That is just arithmetic. We can also have very spirited debates about whose pocket we should take those taxes from. This is the “distributional” question. Or to put it in laymen’s terms, this is the issue of “fairness” or “equity.” While economists have a lot to contribute to these discussions in terms of analytical rigor, at the end of the day, one’s views on this are determined by non-economic factors, such as ideology, religion, one’s sense of justice, and so on. Economists may get passionate on these issues, but there is really no reason that a randomly drawn economist’s view of the “fair” level of income redistribution should be given any more weight than a randomly-drawn non-economist’s view. But there is a third factor – one that is at the heart of economics. It is the issue of the “efficiency” of a tax system. And by efficiency, we don’t mean something as narrowly conceived of how much it costs the IRS to collect your taxes (although that is a part of it, albeit a tiny one). Rather, what we really care about are the incentive effects of taxation. To use economics terms, we care about “substitution effects” of taxes (as opposed to the income effects above). And we care about the “deadweight losses” that arise when taxes distort incentives. Put simply, for a given amount of revenue raised, some taxes destroy more economic activity and/or population well-being than do others. This is because of the natural human behavioral response to switch away from taxed goods or activities and towards untaxed (or lower taxed) goods or activities. So, when we tax labor earnings, people work less. When we tax capital, people invest less. When we tax wage income more heavily than health insurance, people get paid a higher share of their compensation in the form of health insurance. When we tax dividends more highly than interest, firms issue more debt and less equity. When we levy tariffs on foreign-made goods, people buy more American-made and fewer foreign-made goods. So, if you wanted to design the PERFECT example of the WORST possible tax, what would it look like? It would be a tax that created a lot of deadweight loss, but raised no revenue. That is, you would impose a tax that changed the way people behave, making them worse off, while raising no revenue. Why would anyone ever want to do this? Well, my hope is that no one ever would want to do it. But that does not stop politicians from actually doing it. My example? The Social Security Earnings Test. If you want an explanation of how the Earnings Test works, you can read all about it by clicking here. But the quick version is this: If you claim Social Security benefits at age 62 but continue to work and earn money over a threshold, then Social Security reduces your monthly benefit by 50 cents for each additional dollar you earn. This is on top of any income and payroll taxes you may have to pay. The Earnings Test is actually not a tax in reality. It raises no revenue whatsoever. Why? Because the money that Social Security reduces your benefit by is actually returned to you in the form of higher future Social Security payments! And the calculation is roughly “actuarially fair” – meaning that for the average person, you get back the same amount with interest that you put in. In other words, the government raises NO revenue from this tax. That is ingredient #1 for the worst possible tax. Ingredient #2 is that the earnings test distorts behavior, causing people to work less than they otherwise would. At least that is my working hypothesis. The issue is this – if people understood that the earnings test is not really a tax, then it should have very little impact on the work versus retirement decision. But most people do not understand this. Rather, they view it as a 50% tax on earnings. As evidence of this, the AARP conducted a survey of Social Security knowledge. When they asked people what would happen to a hypothetical 63-year old who continues to earn $40,000 per year while collecting benefits, four out of 5 people ages 55 -66 correctly answered that this would reduce his current benefit. Then, equally importantly, 3 out of 5 respondents believed that this person would never get the money back. So there you have it. The “tax that is not a tax.” You get all the negatives (i.e., distortion of labor supply decisions) and none of the revenue. This idea was implemented so poorly that one might just think it was thought up by the U.S. Congress. And you’d be right. Green Taxes Part III: Potential Revenue for Illinois? In my last two blogs, I wrote about ways to meet the Illinois state revenue needs, ways that might work better than the increase in the income tax. This blog continues the list of possible “green taxes”. In general, a green tax applies either directly on pollution emissions or on goods whose use causes pollution. For raising a given amount of revenue, the basic argument for green taxes can be summarized by the adage: “tax waste, not work”. That is, a tax on pollution might have good effects on the environment, because it discourages pollution. In contrast, an income tax discourages earning income. In early January 2011, the State of Illinois enacted legislation to raise the personal income tax rate from 3% to 5% and to increase the corporate income rate from 4.8% to 7%. Along with a cap on spending growth, these tax increases reduce the state’s projected budget deficit in 2011 by $3.8 billion (from $10.9 to $7.1 billion). The governor justified the tax increases on the grounds that the State’s “fiscal house was burning” (Chicago Tribune, January 12, 2011). In my piece with Dan Karney for a recent IGPA Forum, we don’t debate what caused the fiscal crisis in Illinois, nor argue the merits of cutting spending versus raising revenue. Instead, we just take it as given that politicians decided to raise revenue as part of the solution to the State’s deficit. Then we analyze the use of a few green taxes as alternative ways to raise revenue. While many green taxes are possible, we focus on four examples that have the potential to raise large amounts of revenue: carbon pricing, gasoline taxes, trucking tolls, and garbage fees. Indeed, as we show, a reasonable set of tax rates on these four items can generate as much revenue as the income tax increase. We apply each hypothetical green tax directly to historical quantities of emissions (or polluting products) in order to obtain an approximate level of potential revenue generation. In a short series of blogs, one per week, we now discuss each of the four green taxes and their potential for revenue generation. In past weeks we covered Carbon Pricing and Gasoline Taxes. This week we cover Trucking Toll and Garbage Fees. Next, residents of Illinois generate approximately 19 million tons of garbage per year (or more than one ton per person per year), and 60 percent of that waste ends up in landfills. Currently, large municipal waste landfill operators currently pay state fees that total $2.22 per ton of solid waste dumped. But few municipalities in Illinois charge fees designed to discourage the creation of waste by residents (Don Fullerton and Sarah M. Miller, 2010, “Waste and Recycling in Illinois,” Illinois Report 2010, pp.70-80). However, empirical evidence shows that taxing garbage at the residential level does reduce garbage production (Don Fullerton and Thomas C. Kinnaman, 1996, “Household Responses to Pricing Garbage by the Bag,” American Economic Review, 86, pp. 971-84). Yet the exact garbage taxation mechanism varies by program. For instance, a fee can be levied on garbage bags themselves or on the containers that hold the garbage bags. Regardless, a tax rate equivalent to one penny per pound of garbage would generate almost $240 million in revenue per year, or 6.3% of the expected revenue from the income tax increase. Finally, consider a Portfolio Approach. 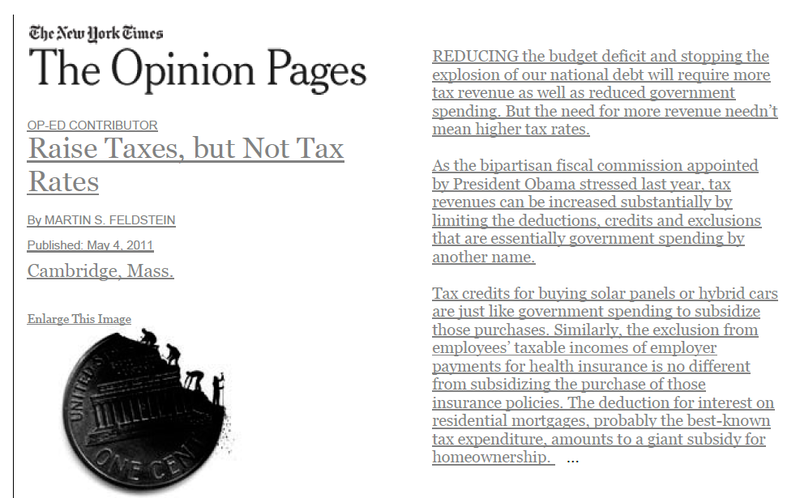 Remember, at issue here is not whether to raise taxes. We presume the State has decided to raise taxes by $3.8 billion (as done already through the income tax increase). Here, we merely explore alternative ways to raise revenue other than through the income tax. Anyway, instead of implementing only one of the green taxes describe above, Illinois could choose to implement several green taxes simultaneously. This portfolio approach would keep rates low for each individual green tax, but still generate large amounts of total revenue that can add up to a large share of the total expected revenue from the recent income tax hike. According to the numbers in all three blogs, one simple and moderate plan would combine the following green taxes and pay for more than half of the needed revenue: A carbon tax of $10/ton would collect $1 billion (raising electricity prices by about 7.5%), a gas tax increase of 14 cents per gallon would collect $0.7 billion (raising gas prices by about 4.4%), a trucking toll of $5 would collect $100 million, and a garbage fee of one penny per pound would collect $240 million. Then the recent income tax increase could be cut by more than half. Moreover, green taxes have the added benefit that they provide incentives to reduce the polluting effects of carbon emissions, gasoline use, truck exhaust, and household garbage generation. Would a 28% Limit on Itemized Deductions be Fair? About two weeks ago, I was contacted by a company that was interested in talking to me for 30 minutes about what information I found valuable as a member of an Audit Committee for a large corporate board. Their creative (and effective) approach to getting me to take 30 minutes out of my busy schedule to talk to them was to offer to make a $300 charitable donation to any charity of my choosing. Because I am currently volunteering on a capital campaign to help a local non-profit institution undertake a major capital project, I figured this was a worthwhile effort. I could help this organization deliver better information to board members, and my favorite non-profit would benefit financially. There are two ways to treat this transaction on my taxes. First – which is the easy route which I suspect most people take – would be to simply ignore this transaction on my taxes, with the rationale being that I received no money. The second way (and the one that may be the technically correct way to do it – but I will have to check with my accountant!) is to report it as $300 of taxable income, and then also report a $300 tax deductible contribution to the non-profit. Either way, my tax liability is unchanged by having spent 30 minutes doing this – the charitable deduction exactly offsets any income. But if the Obama Administration and Congressional Democrats have their way, and if I were to perform such a civic act in the future, I would owe about $21 in taxes on this transaction, even though I never received a penny. Why? As reported in the July 5 Wall Street Journal article by John McKinnon and Carol Lee, Democrats would like to impose a cap on the value of itemized deductions. Instead of allowing me to offset my income at my 35% marginal tax rate, they would cap it at 28%. So, now, I would pay a 35% tax on the $300, and then only get to deduct 28% of $300. Thus, I pay the difference (7% of $300) in taxes, even though I never saw the money. I find the Democrats’ position is a difficult one. We have a progressive tax system that imposes higher marginal tax rates on higher incomes. Basically, the rich pay more, on average. So then we decide – for reasons that may be the subject of a future post – that some activities (such as charitable contributions) should be tax deductible. But then we argue that it is not fair to give a tax deduction to the high earners because they “benefit” more. But the only reason they “benefit” more from the tax deduction is because we have imposed a higher tax on them to begin with! So in the name of fairness, we levy higher taxes on the rich, and then in the name of fairness we complain about its implications? My bottomline is that “fairness” is not actually a well-defined concept. It is also not a topic on which the economics profession has any comparative advantage in addressing. We are much better at understanding the impact of policy on incentives, and even on how a policy affects resource distribution (a topic which is presumably related to many concepts of fairness). So I am always a bit wary when people make unequivocal statements about fairness to justify a policy. Green Taxes Part II: Potential Revenue for Illinois? Last week, I wrote about carbon pricing as a way to meet the Illinois state revenue needs (instead of an increase in the income tax). This week, in the “continuation”, I write about a possible increase in the gasoline tax. First, I’ll set the stage again. In early January 2011, the State of Illinois enacted legislation to raise the personal income tax rate from 3% to 5% and to increase the corporate income rate from 4.8% to 7%. Along with a cap on spending growth, these tax increases reduce the state’s projected budget deficit in 2011 by $3.8 billion (from $10.9 to $7.1 billion). The governor justified the tax increases on the grounds that the State’s “fiscal house was burning” (Chicago Tribune, January 12, 2011). In my piece with Dan Karney for a recent IGPA Forum, we don’t debate the reasons for the underlying fiscal crisis in the State of Illinois, nor argue the merits of cutting spending versus raising revenue to balance the budget. Instead, we just stipulate that politicians decided to raise revenue as part of the solution to the State’s deficit. Then we analyze the use of “green taxes” as an alternate means of raising revenue that could mitigate or eliminate the need for increasing income taxes. In general, green taxes are taxes either directly on pollution emissions or on goods whose use causes pollution. In the revenue-raising context however, the basic argument for green taxes can be summarized by the adage: “tax waste, not work”. That is, a tax on pollution might have good effects on the environment, because it discourages pollution. In contrast, an income tax discourages earning income. While many green taxes could be implemented, we focus on four specific examples that have the potential to raise large amounts of revenue: carbon pricing, gasoline taxes, trucking tolls, and garbage fees. Indeed, as we show, a reasonable set of tax rates on these four items can generate as much revenue as the income tax increase. We apply each hypothetical green tax directly to historical quantities of emissions (or polluting products) in order to obtain an approximate level of potential revenue generation. In a short series of blogs, one per week, we now discuss each of the four green taxes and their potential for revenue generation. This week: Gasoline Taxes. Gasoline sales in Illinois are subject to a state excise tax set in 1990 at $0.19 per gallon. In addition, other state fees and a federal excise tax of $0.18 per gallon are applied to gasoline sales for a total tax rate in Illinois of $0.61 per gallon, according to the American Petroleum Institute. However, economic studies find that the existing tax rates on gasoline are below the optimal rate that would account for all the costs of pollution and time wasted due to traffic jams. For instance, the “optimal” U.S. total gasoline tax has been estimated to be about $1 per gallon, according to Ian Parry and Kenneth Small (2005), “Does Britain of the United States Have the Right Gasoline Tax” [American Economic Review, 95(4): 1276-89]. Illinois would have to raise the tax rate by 40 cents to reach that $1 total optimal rate. The third line of table 2 shows that a $0.40 per gallon gasoline tax hike would collect approximately $2.0 billion (just over half of the $3.8 billion from the income tax increase). Yet that tax increase would raise by 12.4 percent the $15.9 billion Illinoisans spend annually on gasoline. Table 2 includes alternative calculations of revenue generation levels from a gasoline tax. For example, a generic 5 cent per gallon excise tax increase would generate $250 million (see table 2 line 1). The existing $0.19 per gallon excise tax in Illinois is not indexed to inflation, so the real revenue to the State from the gasoline excise tax has steady fallen over time. The second line of table 2 calculates that the state could adjust the tax rate back to its 1990 purchasing power by raising the rate 14 cents per gallon (from 19 cents to 33 cents). That would just account for inflation since 1990. The increase in revenue would be $700 million (which is 18.3% of the expected revenue from the income tax increase). Illinois residents would then pay 4.4% more for gasoline, INSTEAD of paying more income tax. The point is that the gas tax would discourage driving and air pollution, instead of discouraging workers from earning income. It doesn’t matter what we CALL it! In a recent Op-Ed in the NY Times, Martin Feldstein points out that the huge current federal deficit can be reduced without raising tax rates, but instead by reducing “tax expenditures” – provisions in the tax code to provide tax breaks (and thus extra money) for many special functions. Martin Feldstein is a Harvard professor, and he is a former President of the National Bureau of Economic Research. His piece is well worth reading, so I hope you click on the link and read the whole article. For the moment, I’ll just use his thoughts to make an additional point – about the fact that a “tax expenditure” is equivalent to a particular kind of government spending. If Congress wants to provide $1 billion for charities, for example, it can either (1) provide a special tax deduction for individuals who give to certain charities, in a way that costs the government $1 billion of lost revenue, or it can (2) add $1 billion to the spending side of the budget to provide the exact same funds to the exact same charities, in a program that would subsidize the same individual donations to the same extent. Those two methods are equivalent in every respect. Every existing “tax expenditure” is really the same as a particular government spending plan. Yet many politicians say they want to cut spending, not raise taxes. Fine. I would just point out that cutting a tax-expenditure could easily be characterized either way. If any eventual deficit reduction plan were to eliminate certain tax deductions for special purposes, it would appear to raise additional tax revenue, but it is not from raising any tax rate. And that effect on the budget is exactly the same as cutting some federal spending. So don’t make arbitrary distinctions between what we call a tax hike and what we call a spending reduction, as nice as those sound bite distinctions might sound to a politician. Any Member of Congress who wants to cut federal spending should be equally happy about a plan to cut a “tax expenditure”. It has the same effect!